It's time to get real with your company travel spend. Let's take a look at Egencia and Concur, the "self-service booking tools" to find out if one of them is a good fit for your business travel needs. You’ve been given the task of finding the best travel management tool for your company. You may be an office manager, an executive assistant or an executive who has been booking travel up until now. But your time spent searching, comparing, getting approval, booking, changing, cancelling etc… it’s all getting out of hand and taking up too much time. Corporate travel management comes in many forms. When you’re a small company you can get away with either one person in your company booking all the travel, or everyone books on their own, or outsourcing to a travel agent. When you are a larger organization, accounting and compliance within a travel policy play a more important role. Generally, companies look to traditional corporate travel managers like Amex GBT, BCD Travel, Carlson Wagonlit and to the corporate self-service tools like Egencia and Concur. Egencia and Concur are the 2 behemoths of “self-service” that you will come across early on. They are attractive because staff can easily search for a flight or hotel, have a list of options within your travel policy, and book. Let’s take a look at how each one stacks up. This is Egencia's meta description and homepage, and you can see they’re trying to cover all angles with the “5 ways toward business travel success” attracting both a traveler as well as management. 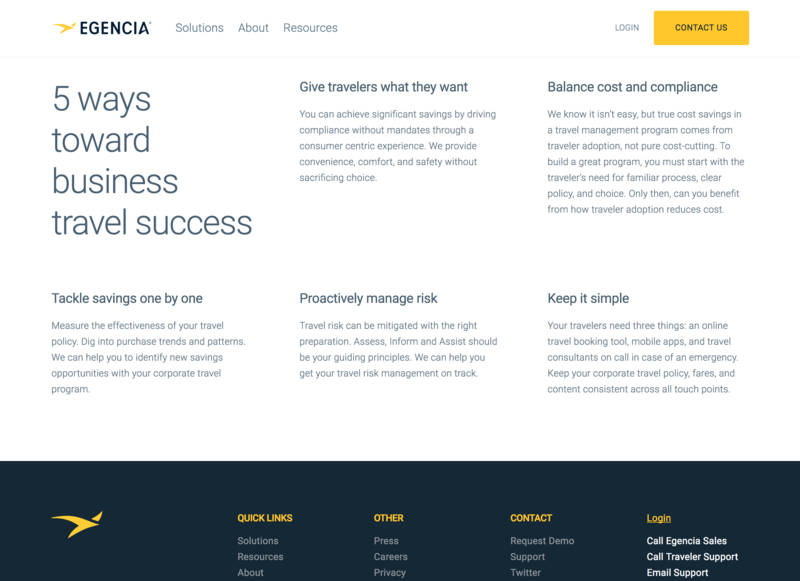 But 3/5 of these sound like fluff; "Proactively manage risk" with "Assess, Inform and Assist"; "Keep it simple" then list a ton of different things; and the only way to save costs is for every one of your travelers to book via Egencia? I doubt it. You can dig in deeper by going through the ‘Solutions’ tab at the top. They correctly push that Egencia is easy for travelers to use as it’s very similar to Expedia (which most people have used) and all your preferences will be there (seats, loyalty programs etc). 24/7 support is a must for most companies as no one wants a call in the middle of the night from a stranded staff member. They promote the use of expert travel agents around the world too which is great, not sure if you get access to them when calling customer service though. Egencia’s average online adoption rate is 91%, meaning that 9/10 of your travel would be booked via the online tool, and the remainder booked by calling an Egencia agent. Their reporting sounds great and very detailed, with many pre-defined reports as well as customizable ones. As Expedia is the largest travel company in terms of total $$ in travel bookings, they have an immense network of suppliers. This can also be a negative though, as they can pressure their suppliers for higher commissions, especially hotels not within a chain. They provide risk management for emergency situations and changes/cancellations. And they offer different payment options which is great but this doesn’t simplify your setup or recommend to you the best way to pay. Travel management consulting sounds a lot like fluff. Meeting + event planning as well, but this goes hand-in-hand with any agency. VIP care for your employees who travel the most or executives. You have to “Request a Demo”, you can’t have a peek around to see how it works before they put you in a priority box defined by your travel spend. It’s also required to add your company name, work email and phone number… like you don’t get spammed enough these days. After requesting a demo, you receive an email from one of their salespeople asking whether you can have a brief call in the next week. Followed by a bunch more emails requesting a call with you, then finally an invitation to join a live demo, which is what you wanted in the first place. Egencia is the corporate arm of the Expedia Group which includes Expedia, Hotwire, Trivago, Travelocity, CheapTickets, Orbitz, Hotels.com and many more. As with most of these online booking tools, a simple trip can be booked simply and efficiently on Egencia. It’s when you have a complex trip or need to make changes or cancellations that the true product is tested. However even with a simple trip, you could be missing out on the best deals as many low cost airlines are missing entirely from their database. On top of this, an airline or hotel can advertise a discounted rate if you book directly with them - you won’t even be aware of this on Egencia and other online travel sites. Many reviews about Egencia from travelers point out that their Known Traveler Number (KTN) and/or frequent flyer numbers don’t get added to their bookings. They then have to call Egencia or the airline to get these added manually. For frequent travelers, this can be a huge pain and makes the online booking tool useless if a call is required as well. The US-based tool is meant to be quite robust and not encounter many errors, but I’ve heard that non-US-based tools are error-prone and have a lot of glitches making it unusable for a lot of trips. Egencia’s mobile app, TripNavigator “keeps you informed on the road” but it lacks many actionable tasks resulting in you needing to call for most things. Out of 36 reviews on Trustpilot, Egencia is rated 2.8/10 with 78% of reviewers selecting 1/5 stars - yikes. Take this with a grain of salt though, most people with positive experiences can’t be bothered to rate. It’s when you have a bad experience that you want to rant negatively about something. The majority of reviews complain about errors on the Egencia site and tool, thus forcing them to call and wait for hours (even days) for an agent to help them. This is especially true when changes or cancellations are needed. Extra fees for calling are also mentioned as well as duplicate charges and errors in names and itineraries. The reviews also mention that the rates are more expensive than booking directly with an airline/hotel or even Expedia. Egencia also doesn’t show prices around the exact dates you select, so if you are flexible by 1 or 2 days, you have to search every combination. The reviews on G2 Crowd are more detailed, reasonable and less hate-filled than Trustpilot. It’s still only rated 3.5/5 and many of the reviews mention the same issues as Trustpilot, but comparing against other travel management tools rate it as average. 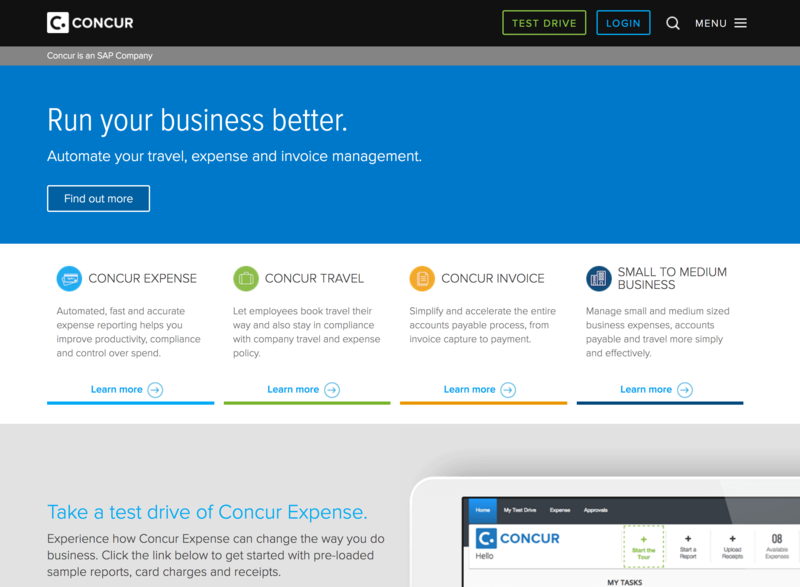 Concur heavily focuses on the expense side more than Egencia, they even have distinct product names, like Concur Expense, Concur Travel and Concur Invoice. They promote using Concur for all expense management (not just travel) to ease reconciliation and reporting, rather than access to 100s of suppliers and exclusive rates like Egencia. For comparison’s purpose, we’re simply going to compare the Concur Travel product as the others have a broader purpose beyond travel. Concur state that 40-50% of employee travel is booked outside of corporate travel systems. 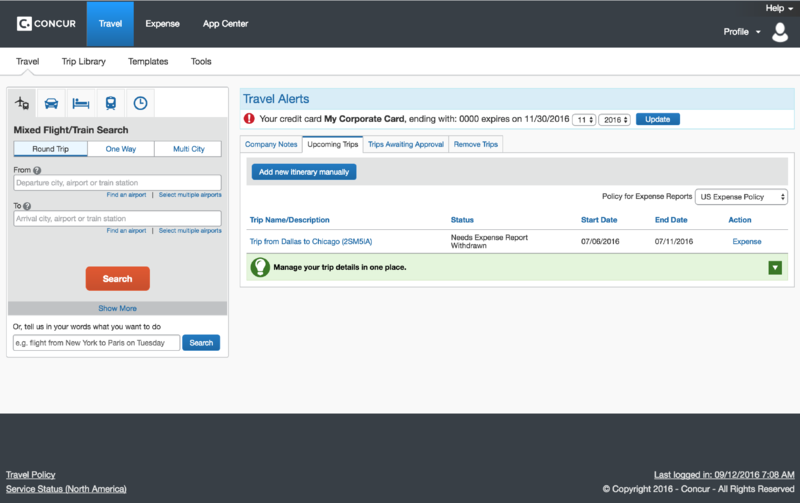 Concur’s TripLink is a feature that aggregates all travel spend whether booked via Concur or anywhere else. This is a big draw in my opinion giving you visibility over all travel as you can’t enforce 100% of staff and travel to be booked a certain way. Similar to Egencia, you can’t have a play with the Concur tools until you give your name, email, company name, number of employees, location and phone number. They do offer a free 30-day trial and you get access to this as soon as you register - you don’t need to talk to a Concur salesperson. However it gives you access to “test drive” only Concur Expense, not Concur Travel. In terms of usability and navigation, Concur is simple and easy as an end-user booking travel, submitting expenses for reimbursement etc. However the opposite is true when setting up the account, customizing for your company and especially with API integration. When contacting support, reviews mention it is often challenging to find someone with sufficient knowledge to answer the question. Poor follow-up, problems left unsolved and difficult to get immediate help are also issues raised. Concur has a mobile app like Egencia but there are many more features (including the ability to take pictures and upload receipts). Many reviewers rave about the mobile app for this reason. Unusually, there is no Trustpilot page for Concur. On G2 Crowd there are a whopping 557 reviews giving an overall rating of 4/5 stars. This includes their number of products including Concur Travel, therefore it’s not an accurate representation of the travel service. There are reviews on TrustRadius for Concur Travel and Expense giving an overall score of 7.5/10 based on 91 ratings. They are very thorough reviews as well from a range of different people using it. Creating, managing and approving expense reports are what users like best about Concur, in particular taking pictures of receipts and integrating with your credit card statement. The negatives are on the travel side, in particular not having the searching flexibility and prices of consumer sites like Kayak and Priceline. Also many reviewers mention the web tool looks very outdated. With the recent acquisition of Hipmunk in late 2016, hopefully Concur will get a design update to the likes of Hipmunk. Overall, Concur gets our nod in terms of simplicity and usability but they lack the pricing resources and experience in the travel space when comparing with Egencia and the Expedia Group of travel brands. To compare these two products properly and find out which is a better fit for your company, we suggest demo-ing both to get a feel for the usability and compare their pricing against a few online sites. We also suggest making a list of any current issues you want resolved and a list of your must-haves in a new travel management product. Specifically ask about these when contacted by a salesperson. If savings are a key focus for your company’s travel spend, request a Flightfox demo today. Flightfox has technical travel experts all around the world who research every trip in-depth to guarantee the best prices. Think of everyone on your team having their own personal travel concierge! Best of all, we don't work on commissions, so we're always on your side.